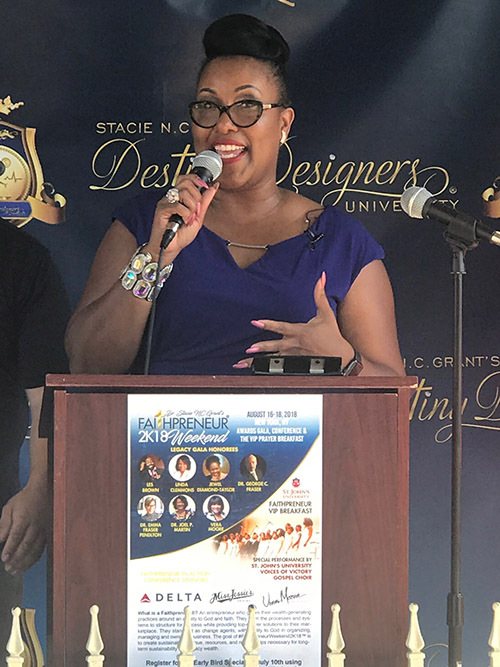 Author, speaker, and Faithpreneur Founder Dr. Stacie NC Grant?welcomed a large crowd of supporters during an afternoon press conference as she announced the upcoming Faithpreneur Weekend 2K18. Held outside of Thomasina’s Banquet Hall on Linden Boulevard in Jamaica, NY, Dr. Grant, award-winning, international speaker and founder of Destiny Designers University, unveiled details of her upcoming Faithpreneur Weekend 2K18, a 3-day succession of business seminars and events, that will be held August 16-18 in Midtown Manhattan at the New York Marriott Marquis Times Square Hotel,?1535 Broadway, New York, New York 10036. 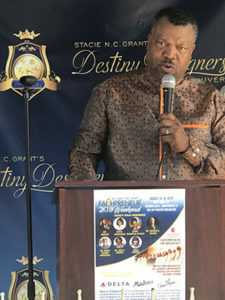 Dr. Grant laid out to the excited crowd the big?’why’ faith-based entrepreneurs need this level of training, saying, “Entrepreneurs, by and large, have not yet figured out the value, or roadmap, for operating their businesses in full alignment with their faith.? Our event will catalyze that transformation.”? The weekend plans to be a live gathering of achievement-driven businesses guided by the moral compass of faith. Joining Dr. Grant for the announcement were several devoted supporters of the business community, many of whom have mentored her along the path of her success for decades. During the press event, while a radiant sun emblazoned the scene, street traffic stalled and passers-by–along with curiosity seekers–stopped to get an ear full of the activity as Dr. Grant announced the participation of very special honorees who will be in attendance at the Awards Gala, like industry legends Vera Moore, president, Vera Moore Cosmetics, Linda Clemons, Jewel Diamond-Taylor, Dr. George C. Fraser, founder, FraserNet?and the PowerNetworking Conference, and best-selling author/speaker/mentor Les Brown, to name a few, along with expert trainers, dynamic speakers, professional panel members and an exciting workshop agenda. The Faithpreneur Weekend conference has also gained corporate support that includes Delta Airlines, Miss Jessie’s, Vera Moore Cosmetics and a growing number of advocates. (l-r:) Vanessa Lindley, President, Lindley Consulting Group LLC, Vera Moore, President, Vera Moore Cosmetics, Stacie with her mother Faye Rhoden. 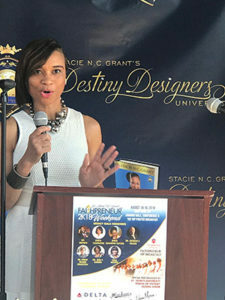 As Founder of Destiny Designers University and the Faithpreneur Movement, Dr. Grant has a body of work that spans the gamut: volunteerism, and servitude, through youth mentorship and civic engagement; community outreach and support, working closely with local elected officials; inspiring lives on world stages, reminding them to take “Action, Action, Despite the Distraction!”–so says the title of her most recently published book. Danielle Douglas, President, Inspire Enterprise, Inc. According to Dr. Grant, who has trademarked the clever word, a Faithpreneur is an entrepreneur who grows their wealth-generating practices around an affinity to God with faith.? They learn the processes and systems to structure for success while providing top-drawer solutions to their marketplace.? They stand out as change agents, with the fidelity to God in organizing, managing and owning a business.? The goal of FaithpreneurWeekend2k18 is to create sustainable revenue, resources, and relationships necessary for long-term sustainability and legacy wealth. Dr. Grant is touching hearts and transforming minds the world over.? Her track record is highlighted by receiving the 2016 Presidential Lifetime Achievement Award for Volunteer Service from our 44th President Barack Obama, along with her 2017 appointment as a Fellow of the Most Excellent Order of International Experts (FOIE). Dr. Grant derives her greatest reward serving people, rekindling dreams, uncovering the foundations for legacy work, and witnessing the shift that takes place in the process of bringing about their greatest successes.